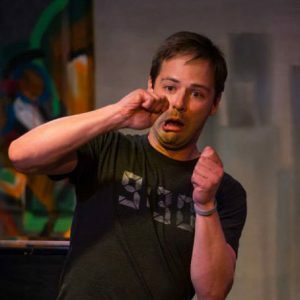 Luke Hennig's improv odyssey began when he joined two friends to form a team for FIST 2013. Their Round 1 show as Interfaith Dental Clinic featured a staging of Gandhi: On Ice. They made it to the final. Since then he’s been performing with local indie legends The Lodge. Most recently, they’ve dabbled in musical improv, self-producing several sold-out shows benefiting local and disaster-relief charities. Luke will write and perform a five-minute character monologue at a moment’s notice. He’s guest hosted trivia at Wonderland Ballroom ten times and played guitar at three friends’ weddings. His uncle Ken Campbell was Santa Claus in Home Alone.